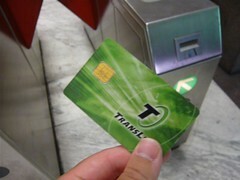 Attention AC Transit riders: if you take any Transbay line and pay with a magnetic striped (paper) ticket media, today is your LAST day to use it. Starting tomorrow, October 1, 2009, Translink will take over all paper media for the Transbay bus lines. From what I've learned, they decided on this switch for three reasons: Need for quicker boarding due to temporary terminal to be opened soon, closure of the AC Transit ticket office at Transbay Terminal, and the fare changes with a three month grace period to fry the old transit tickets. This basically translates into cost savings for the agency. This policy of forcing all paper ticket holders to switch to Translink is following a new trend; it's working very strongly on Golden Gate Ferry with over 70% of weekday riders paying with Translink, and Golden Gate Transit with about 24% of their weekday ridership using the card as well. Golden Gate gave-up on the paper tickets as a cost measure, but to also encourage people to feed Commuter Checks electronically via Translink to also save trees by not sending out vouchers to registered users. For those paying with cash or you Cal students with a flash pass, you can still use those types of fare media.